As I am no expert blogger, I always try to include the input and knowledge of others when I write blog posts like this one. 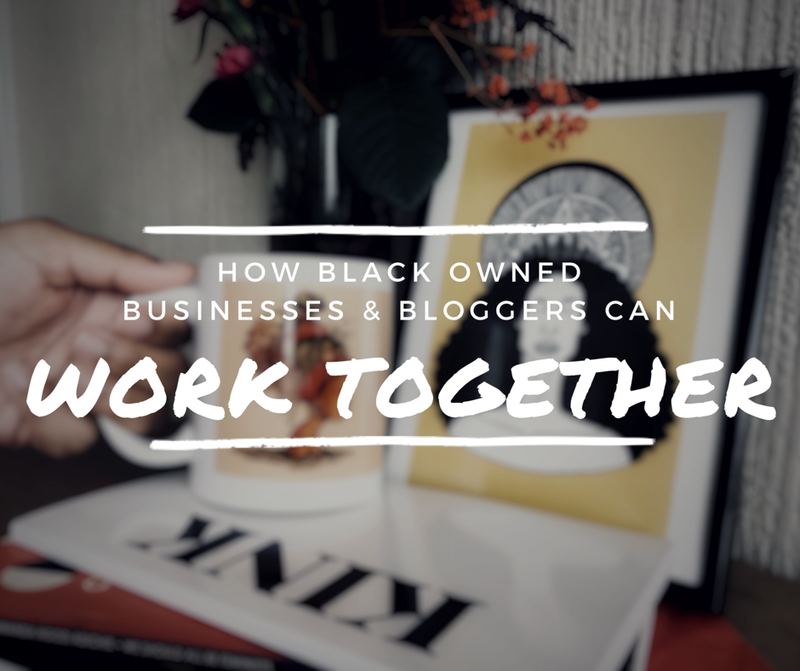 With that being said I have spoken to two women who know exactly what they are talking about and have heaps of knowledge to share on the topic of black owned businesses and bloggers working together. I asked Ronke Lawal founder of PR company Ariatu PR and Mariam Bashorun founder of the black bloggers platform Black British Bloggers a few questions on the topic. Both of these lovely ladies have been great throughout my blogger journey, It was a must to have their input included in this post. I am still buzzing from last years Black British Bloggers Social event. As I started my journey without understanding the business side of things nor understanding the industry this event was extremely helpful – Look out for this years Black British Bloggers Social this August! The whole blogger/influencer marketing industry is still relatively new, and because of this I think we will always be learning on the job, which in a way keeps it interesting. So I understand why there are not as many black PR companies and Black owned businesses organising press trips. I feel like this is a good conversation to have for black bloggers specifically, we are in a position where we can help build each other up. As we already know BOBs do not always have the same level of support and financial backing as these big companies do. This makes it harder for BOBs to be able to budget for influencer marketing. However this doesn’t mean all BOBs do not understand the influencer marketing industry, many will have a budget for it, many understand the value that influencers/content creators and bloggers have. Instagram is becoming a really useful tool for influencer marketing. It is one of the easiest and quickest way to collaborate on a project. You can use instagram for takeovers, live chats, sponsored content, videos and obviously for posting pretty pictures. > Go Live – You can do this with a blogger/brand, have a conversation you and your followers will engage in. I think it is important for us to use our platforms to start up a conversation or to bring awareness to conversations that we need to have in our community. You could speak to a Tricologist live and speak about the recent Eco Styler ingredients list, this is a good way to educate your audience and to bring attention to a professional. > Instagram Takeovers – Did you watch my takeover on The Antidote Street‘s instagram for their Deep Conditioning Dance Party? Something fun like having a blogger doing a talk through video on your platform like this is a good way to bring attention to both the business and to the blogger, be creative! Create a Community – Feature your customers on your story and encourage your customers to get involved by using a hashtag. You can get bloggers involved as well to help spread the word of the hashtag, a new product or event. One of the best things about instagram is the ability to build communities with similar interests, utilise this. Do not rely on social media, get into speaking engagements, stalls and panels. It sheds light on organisations that are trying to target an audience on a specific topic. It brings the community together for those who may not have a space outside of the Internet to get the information they want. Think of it as a way to better connect with your consumers, what do they want to know? Can you provide that information? If not do you know someone who can? Like Afro Hair & Beauty Live their vendors pay influencers/bloggers to help with their stalls and to engage with customer interests. If you already have a community of people who use and like your product or service and their audience is an audience you want to reach why not invite them to your events and workshops. If you want to invite a blogger for free offer something other than the possibility of exposure. Black British Bloggers had their first Birmingham event where they had Lifestyle & Fashion blogger @Tashpantz, founder of Bourn Beautiful Naturals Kadian and Birmingham Podcasters Who Got The Juice all speak at the event to share their knowledge. Bring together people who can bring some much needed knowledge to others. Think about what areas you,your customers or audience want to know more about and bridge that gap. *Do not be afraid to Reach out to others! One of the most familiar ways to collaborate is to use the platforms you already have like your blog and/or Youtube. Whether it is a product review, event coverage or an experience. Blog Interviews – Interviews are quick and easy to read and they give the readers an insight into various industries. An example would be my two-part post: Q&A With Black Business Owners. Share Your Experience – Ronke suggested filming or writing up about your trip to one of your favourite Nigerian restaurants. Sharing your experience and thoughts on the menu, food, pricing etc. This has the potential to encourage others to visit that restaurant, which could lead to future opportunities to work together. Supporting and sharing small and upcoming businesses is just as important as supporting the bigger businesses. This is one is one I think needs to happen more. Be open to sharing skills, Afrocenchix is doing this through their internship program, encouraging others to understand the process of starting and building a business. > In Store Collaborations – Having a few bloggers come down to show them what your business is all about. With so many food bloggers on the scene having a few down to learn how to cook a famous dish is something that businesses should consider. Find Out What Is Needed – I always hear that a collaboration should be a two-way street, which is right. However going with intentions to help others is a good way to build a relationship. Ask if a BOB needs support in any certain area that you feel you can help with or point them in the direction of the right person. I have had people ask If I know of someone for a certain service and a quick look through my following list and I was able to help someone out. Also check out Ronke Lawal youtube channel to find videos on the topic of business, productivity and more. One video I would highly recommend as it relates to this blog post is How To Work With Influencers Thank you so much Mariam & Ronke for your continued support and for sharing such useful information for this post. Previous How Do I Grow Healthy Natural Hair?